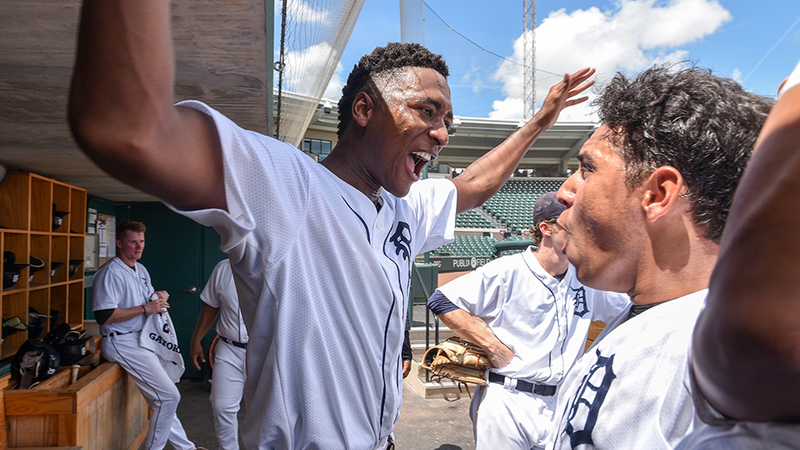 The Tigers West walked off into the Rookie-level Gulf Coast League Championship Series thanks to a dominant showing from starter Xavier Javier and a brush of good fortune. The Tigers right-hander twirled the best outing of his professional career -- allowing an unearned run on one hit and one walk while striking out a career-best 11 over six frames -- and a wild pitch with a runner on third proved to be the difference as the GCL Tigers West punched their ticket to the Finals with a 3-2 victory over the GCL Red Sox in 11 innings Sunday at Tigertown. "Man, it feels great," said GCL Tigers West skipper Brayan Pena. "All the hard work that our kids and the coaching staff put up all season really paying off at the end here. They really did a tremendous job and to be able to play in the Final, you just have to give them credit." The 20-year-old allowed a leadoff single to start the game, but faced the minimum through the first two innings after a strikeout and a double play on an attempted steal ended the opening frame. Javier ran into trouble in the third inning. After issuing a leadoff walk to Chad Hardy, the native of the Dominican Republic threw away a sacrifice-bunt attempt by Ricardo Cubillan. That put runners on the corners and Javier later threw a wild pitch that scored Hardy. He was perfect from there, retiring the final 11 hitters he faced -- six via punchout. "He had a great game. This is a young man who has a very bright future," Pena said. "For him to deliver the game he did today was big. It showed his character and the way he goes about his business. After that little miscue in the third, he came back to the dugout and said, 'Guys, my fault. But I got your back.' And that's exactly what he did. He went back to grinding, kept the game close and gave us a chance. That was impressive." Justin Childers and Ildemaro Escalona drove in the Tigers' runs with RBI knocks in the fifth. After the Red Sox knotted the score in the eighth, Moises Bello drew a leadoff walk in the 11th and moved into scoring position on a sacrifice bunt by Eliezer Alfonzo. Jose Salas grounded out to move Bello to third and a wild pitch by Alberto Franco scored Bello. "All the credit to Bello on that play," Pena said. "He anticipated a wild pitch and got a big jump on the play. The ball didn't make it to the backstop, and there was a close play at home, but he beat it out because of his anticipation. He made it happen."